Time to escape into the woods. Morning mist at Trough Creek State Park. Photo by Ed Stoddard. You can learn a lot about how our forefathers did things and see remnants of history on quite a few treks; the Standing Stone Trail, for one example. I love the fact that we have so much public land available and undisturbed within the Raystown Lake Region for exploration. You almost travel back in time to the timbering, railroad and subsistence era that our great-grandparents lived in…I feel looking back and appreciating the historical sites is a great way to give thanks for the toil those folks invested that built our world today. Not all of our trails are on land. Every summer the Juniata Clean Water Partnership takes a few days off for the Juniata River Sojourn. It is a great event with good fellowship and catered meals along the river. Paddling on the Juniata below the dam is a favorite byway on slow, gentle water. I have also heard that some of our resident eagles are often seen hunting on that stretch of water. You have all of the 118 miles of shoreline to paddle and the no-wake zones to explore on Raystown Lake. The Huntingdon County Visitors Bureau has a lot of trail information at the Raystown Lake Region Visitor Center, in the “Things to Do” section of the Huntingdon County Visitors Guide and posted to raystown.org. 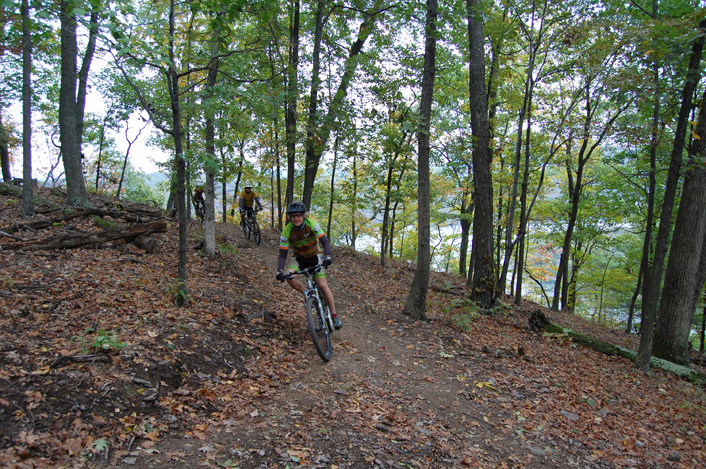 We link out to TheAlleghenies.com, DCNR, Mid-State Trail Association, the Standing Stone Trail Club, Raystown Mountain Bike Club and other expert sources for trail information in the Raystown Lake Region. Rothrock Outfitters maintains the website for the Allegrippis Trails; and they have a whole library of Purple Lizard Maps for the region, trail maps and guide books for sale. We have trails that are easy hikes to boot busters, bike rides from road to “rollercoaster” trail and water trails that are great paddling trips through our fantastic scenery and historic canal remnants. 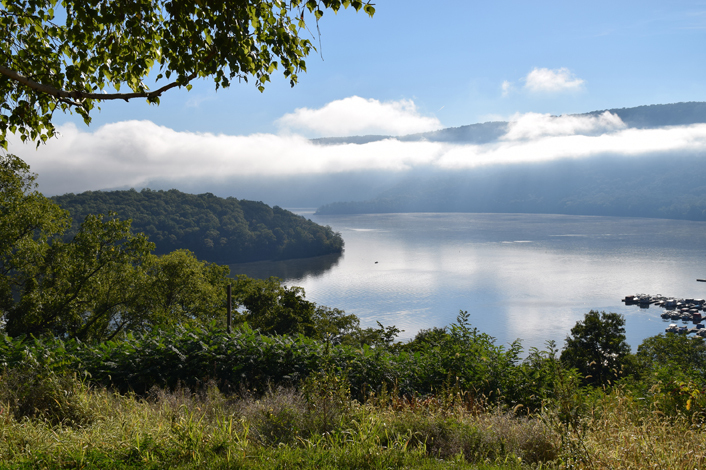 This author recommends: Get outside and enjoy the wooded paths and gentle waters that the Raystown Lake Region offers. Take only photos; leave only footprints. Mike Hermann of Purple Lizard Maps rides the Allegrippis Trails. Photo by Ed Stoddard. Some of the least strenuous trails in the area include Hillside Trail that loops from the Raystown Lake Region Visitor Center for about 1/2 mile, Riverside Trail that follows the shore of the Juniata River downstream from Raystown Dam for about 1/2 mile, and the Buck, Doe and Fawn trails that are part of the Allegrippis Trail system in the Seven Points Recreation Area at Raystown Lake. Take a walk, run, or bike ride on the brand new 2.5 mile Greenside Pathway in the Seven Points Recreation Area at Raystown Lake. The pathway connects 19 different recreation facilities and is composed from 100% recycled tires; which means that your run, ride, or walk will not only be convenient, but comfortable and environmentally friendly. Another set of easy to moderate paths would be the Flagpole Hill Trails in Huntingdon — probably at least 10 miles of trails that interweave through the forests and hills just outside of the Borough of Huntingdon. The Lower Trail runs for almost 17 miles from near Canoe Creek State Park in Blair County northeastward to near Alexandria in Huntingdon County. The trail is extremely flat with only a slightly noticeable grade when riding from east to west. The Lower Trail is open year-round for hiking, biking, horseback riding, bird watching and photography and, in the winter months, cross country skiing and snowshoeing (any non-motorized use).The trail has a rolled crushed limestone surface except for a 2 mile asphalt section through the Borough of Williamsburg and running northeastward. 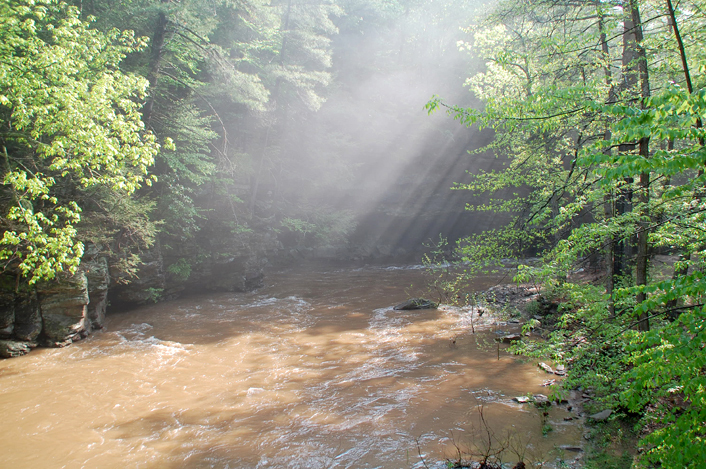 Moderate trails in the area include section hikes on the Mid-State Trail, Mid-State connectors like the Jackson Trail on the border of Huntingdon and Centre County and one of my favorites The Ironstone Loop in Stone Valley. The Ironstone Loop is 15 miles of deep valleys and high vistas. 1,000 Steps Trail is a part of the Standing Stone Trail system. The 1,000 Step were climbed by quarrymen every day on their way to work in the quarry. They climbed from the highway to the top of the mountain. It is almost 800 ft in elevation change! Over 1,000 steps to climb! Accessed from US Route 22 between Huntingdon (8 miles east) and Mt. Union (2 miles west). Look for heritage trail markers on both sides of RT 22. Parking is on opposite side of the River. There is a small spring at the trail head. Follow blue blazed trail 300 yards to the base of the steps and begin hike from here. Named one of the top 4 mountain bike trails in North American by Mens Journal magazine, the Allegrippis Trails are more than 30 miles of stacked loops that allow you a multitude of riding or hiking options. The trails were built by mountain bikers for mountain bikers. (Maintained by volunteers organized by the Raystown Mountain Bicycling Association and on lands leased by the non-profit Friends of Raystown Lake.) I love to hike these trails in the spring and fall to get bonus views of Raystown Lake when the leaf canopy is lighter. Rothrock Outfitters will tell you to go ride ‘em — and I agree with that too. 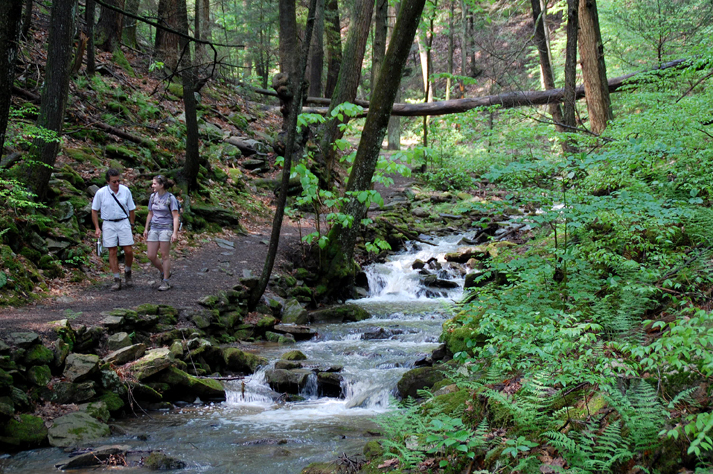 Terrace Mountain Trail, 30+ miles that primarily runs the eastern ridge above Raystown Lake. The trail meanders by Trough Creek State Park, through Rothrock State Forest and Army Corps of Engineers land. Many access points exist that could help to make this a great trail for section hikes, if you don’t choose to do the whole 30 miles in one outing. Note that major trail maintenance is underway to make this a more mountain bike and boot friendly path. Hiking at Trough Creek State Park. Photo by Ed Stoddard. About the Author: Ed Stoddard first discovered the Raystown Lake Region in the 1990s and visited here often before moving to Huntingdon County in 2009. He is currently the marketing director of the Huntingdon County Visitors Bureau. Ed, Heather and Genevieve Stoddard reside in the historic district of Huntingdon. Mike Hermann of Purple Lizard Maps and Evan Gross of Rothrock Outfitters both contributed to this article – thanks! NOTE: This article will be continued in future blog posts. Stay tuned for information on water trails, road bicycling, and geocaching!